For users that want to watch free videos, movies and get movie recommendations. Free Movies - 1000s of FREE Bollywood and Hollywood movies from YouTube, HotStar, ErosNow, Spuul, BoxTV and others. 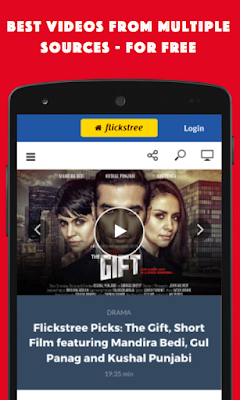 Watch movies online, only through Flickstree. Critics Recommended - Critically acclaimed films, recommended by Rajeev Masand, Shubra Gupta, Anupama Chopra, Raja Sen and many others. Cricket Videos - Sports Video for Cricket, Best moments from cricket and highlights of great cricket matches. Short Films - A highly curated selection of Award Winning Short Films. Documentary - A highly curated selection of Award Winning Documentaries - films that are based on real life events. Funny Videos - Pranks, reverse pranks, Whatsapp funny videos and humorous videos from internet. Bengali Movies - A Great Selection of amazing Bengali movies. Tamil Movies - A Great Selection of amazing Tamil movies. Telugu Movies - A Great Selection of amazing Telugu movies. Malayalam Movies - A Great Selection of amazing Malayalam movies. Hindi Dubbed Movies - A Great Selection of amazing movies dubbed in Hindi. World Cinema - A Great Selection of amazing movies from around the world. Short Movie Clips - A Great Selection of short clips from various popular movies. Start-up Videos - Lessons and Stories of Entrepreneurs. Motivational Talks - TED and TEDx talks by amazing speakers, both Motivational and Inspirational. Amazing & Astonishing Videos - Stunning & Bizarre videos, surprising and sometimes shocking and many such more. Developer: Flickstree Productions Pvt. Ltd.